Gucci sandal in multicolor metallic sequins and leather trim. 4.3" metallic covered stiletto heel. Straps band open toe. Asymmetric vamp. 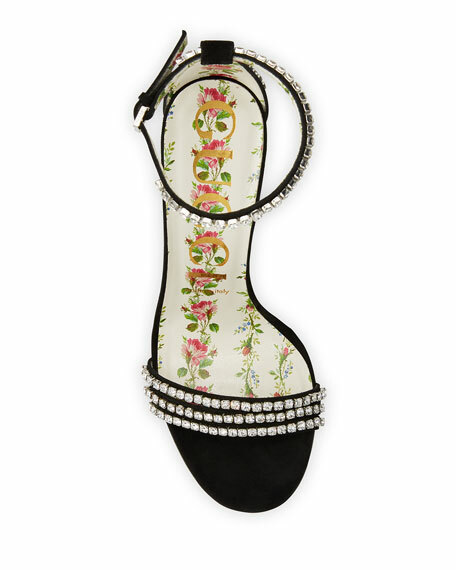 Gucci sandal in multicolor metallic sequins and leather trim. 4.3" metallic covered stiletto heel. Straps band open toe. Asymmetric vamp. Adjustable slingback strap. Rosebud leather lining and sole. Made in Italy. Fit: Runs true to size. 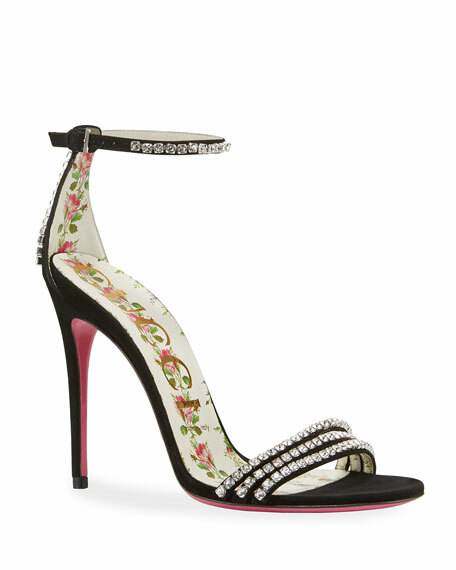 Gucci metallic napa leather sandal with asymmetric floral embroidery. 4.1" covered stiletto heel. Straps band open toe. d'Orsay silhouette. Adjustable ankle wrap. Padded footbed. Smooth outsole. Made in Italy. Fit: Runs true to size.